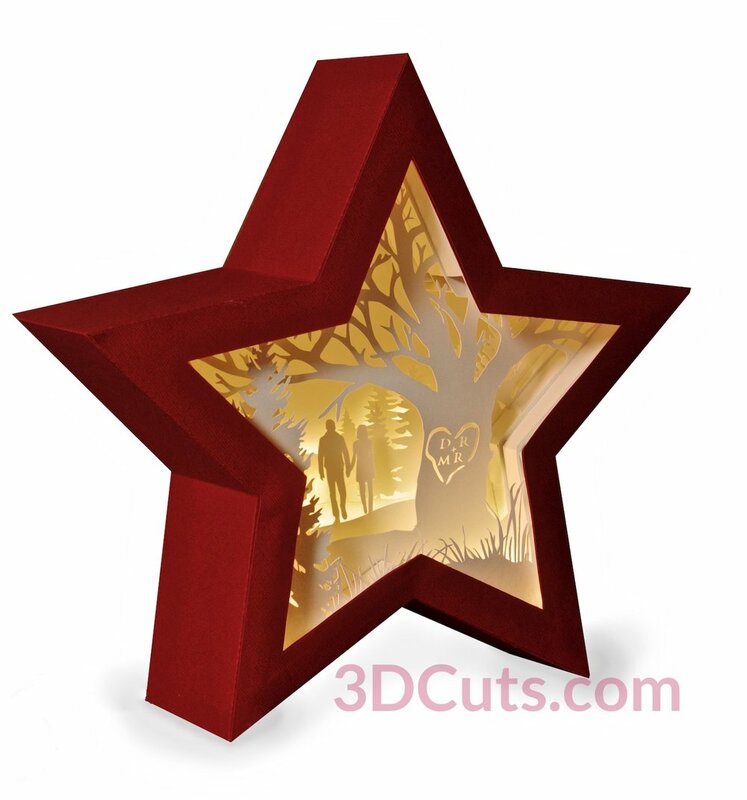 Make a stunning illuminated shadow box to be installed in a standard wooden 11 x 11” shadow box frame. 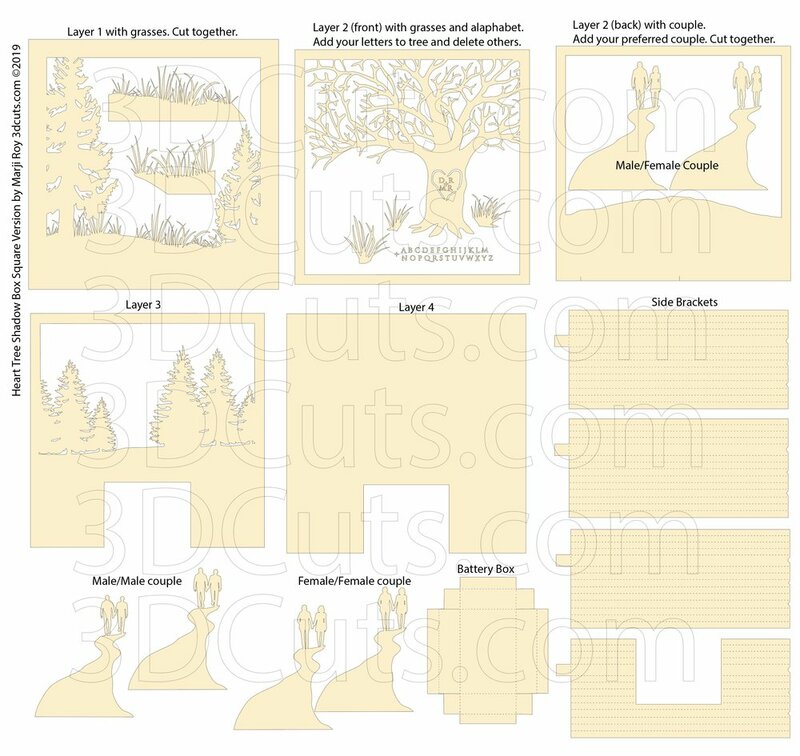 This tutorial is for the assembly of the Heart Tree Shadow Box in the square format. (Star Format here). This project uses 12 x 12” card stock for the multiple internal layers but is designed to fit in a glass front frame to create a lasting gift. (Links for frame and lights below).The download includes three couple selections- either male/female, male/male or female/female. You select and cut the couple that is appropriate for your project. The initials carved into the tree are also customizable. 1 10.5 x 10.5” piece of mat board ( Use scrap- color doesn’t matter. Special Note: I update the instructions online. Check here for adjustments and additional information. Don't just rely on the pdf file that comes with the download. Learned hints are added to the online tutorial. 1. 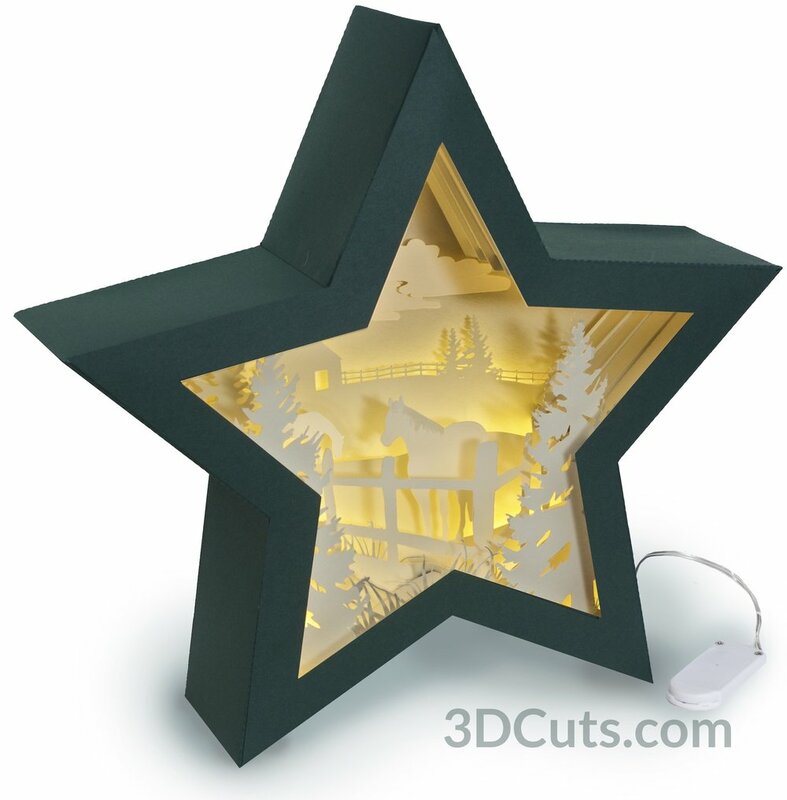 Download the cutting files for your cutting machine here from the 3dcuts.com store. For Cricut Explore: Here is a guide for importing into Cricut Design Space. http://www.3dcuts.com/tutorial-adding-3dcuts-files-to-cricut. Remember to ATTACH files before cutting in Cricut. For Brother ScanNCut: The svg files will need to be transferred to files for your particular machine. You can change SVG files to FCM files at http://www.canvasworkspace.com/ or Google "How to import SVG files into a ScanNCut" for links to tutorials. Some models of Brother Scan N Cut can directly import the SVG files. I recommend 65 lb test light colored card stock for this project. The light needs to shine through to show some of the details and if you use thicker card stock the light will be reduced. I used card stock from the Michaels Recollection collection. These seem to cut well with the intricate cuts. I do not recommend card stock with a heavy tecture or card stock with a white core. The side brackets can be of a slightly thinner card stock but definitely not thicker. They will not fold if you use 80lb test on the side brackets. You need two sheets of 12 x 12 for the side brackets. The backing is a 10.5 x 10.5” square of mat board. This needs to be heavy because it holds the battery pack for the lights in place. Color doesn’t matter because it is in the back and covered. Heavy chip board is fine. The battery box fits on 8.5 x 11 card stock and can be any light color. It is a support item and not visible. 5. Customize the cutting files. 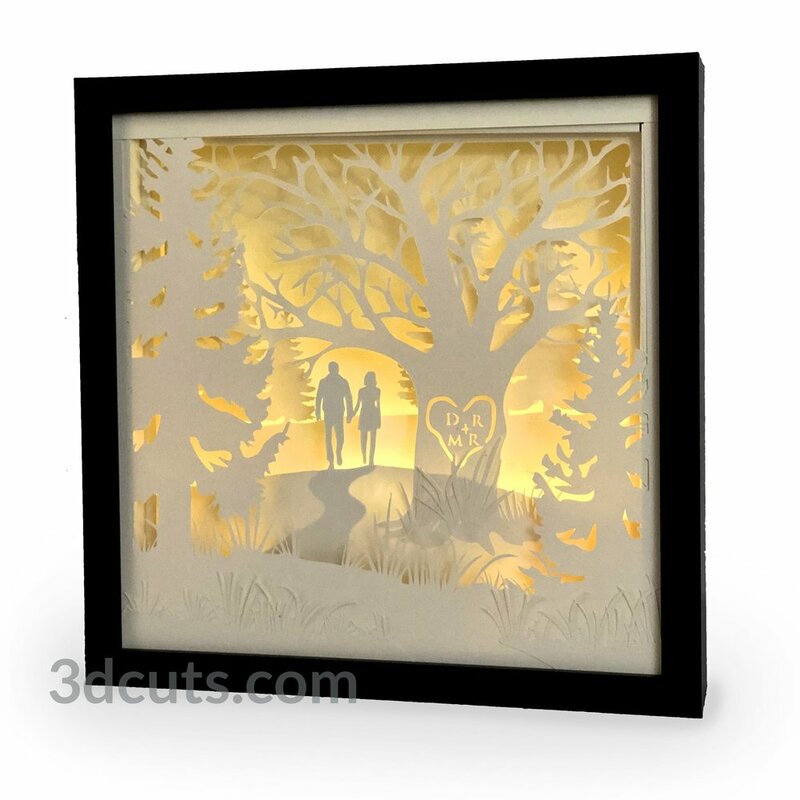 Couples: The shadow box includes a couple holding hands and walking. The download comes with three couples - male/female, male/male and female/female. Position the two layers for the couple into the empty space of layer 2 (back)before cutting. You do not need to cut the couples you are not using. Initials in Tree: The initials in the tree can be customized. The entire alphabet is included in a carved style font. These are objects and you can slide them onto the tree into the heart. Remove the ones there and replace with the appropriate initials for your couple. You may need to ungroup the file to gain access depending on your software. Delete all the unused alphabet characters before cutting to save time. Different Frame: I designed the file for a specific frame that can be easily purchased from Amazon. The file can be adapted to other square shadow box frames. But know that the depth of 1 1/4” is important. If you go with a different frame you can adjust the size of the pages but not the size of the battery pack. To adjust the layers make sure that are all in the same document, group them together and shrink or expand proportionally. I did try this in a 9 x 9 frame but there wasn’t enough room for the depth of the battery pack and it had to stick out on the back side. I really was much nicer in the 11 x 11” size. There are some fine lines. It is best to have good quality card stock and a good blade and clean, sticky mat. I use the Premium blade. Dashed lines: I use dashed lines for fold lines. On my cutting machine these cut much fast when they are positioned horizontally for cutting. Separating these files from the mat took care. I carefully separated parts as I lifted. Smaller pieces had to be weeded out after. 7. Assemble all the parts: This video walks you through the assembly step-by-step. 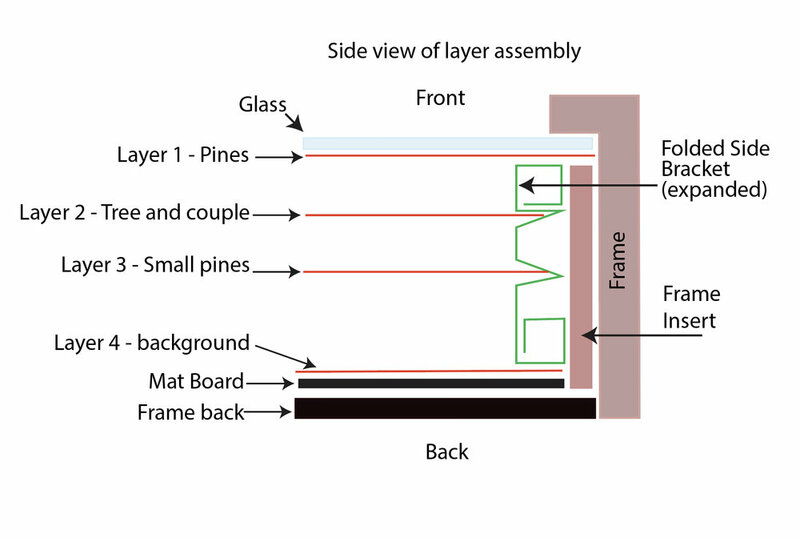 This diagram shows you how the layers go together. The video gives clear instructions on this assembly. Here are four other illuminated shadow boxes designed by me. Cutting files are here.